What a wonderful Saturday so far. Much needed after my Friday. I can’t say Friday was horrible as I had a good tough workout in the morning and after work the Mr. and I had a great, relaxing dinner out together (even the pup got to join us!). My work day just didn’t go exactly how I wanted it to. All is well though…everything works out and happens for a reason. I just have to stay positive! Anyhow, back to this morning. After being woken up way to early by the pup (or possibly I just couldn’t sleep), as usual, I made my 7am call to chat with my mom. Like my parents, I am an early riser so I always know when the rest of the world is still sleeping on a Saturday morning I can always call and catch up with my mom 🙂 While talking, she mentioned she wanted to do something before heading in to work today (it’s tax season so she is working 6-7 days a week…yuck!) and mentioned she might walk Greenlake. Hearing that, I quickly invited myself and the pup to join her 🙂 So, by 8:15 this morning we were both grabbing our Starbucks and heading out for a good walk around the lake! So nice to get out and enjoy the fresh air, catch up and get a little exercise in. Thanks mom! Looking forward to the rest of the day. Right now, the Mr. is off playing in a golf tournament while I enjoy relaxing at home. Later this afternoon, we are planning to meet a group of friends at a new bar on Capitol Hill called Von Trapp’s. Afterwards, we are all heading to the Sounders game! While I have some downtime at home, I figured I should share this amazing dish I made last week. I absolutely loved it so I hope several of you will give it a try. I found the recipe in the March 2013 issue of Fitness Magazine. The flavors in this dish were awesome. Although it took a little time, it was well worth it. Hope you enjoy it as much as we did! Have a great Saturday…I know I am looking forward to the rest of my day! Preheat oven to 375°. Cut squash in half horizontally and remove seeds; place cut side down in a baking dish filled with about 1 inch of water. 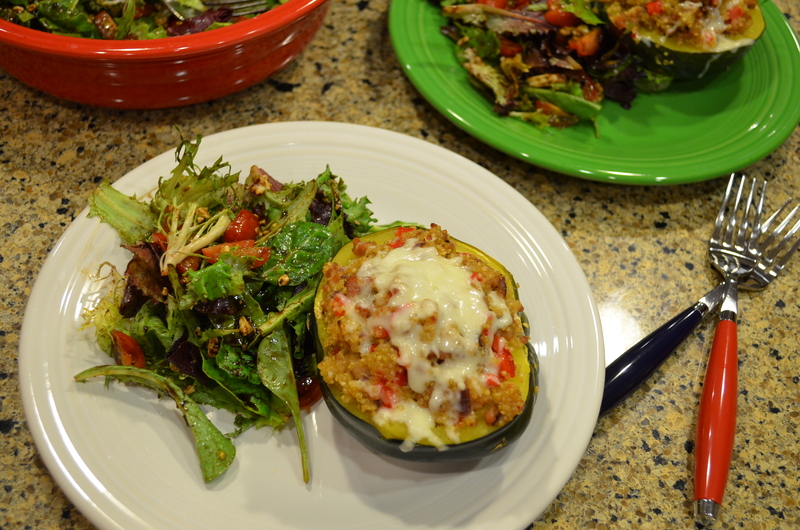 Bake 45 minutes, or until a knife or fork easily pierces the squash. Meanwhile, bring broth to a boil in a medium saucepan. Add quinoa and simmer, partially covered, over medium-low heat for 15 minutes. Turn off heat and cover pot. Heat oil in a large nonstick pan over medium heat. Add sausage, cumin and salt. Sauté, breaking up meat with a spoon (5-10 minutes). Add onion, bell pepper and garlic. 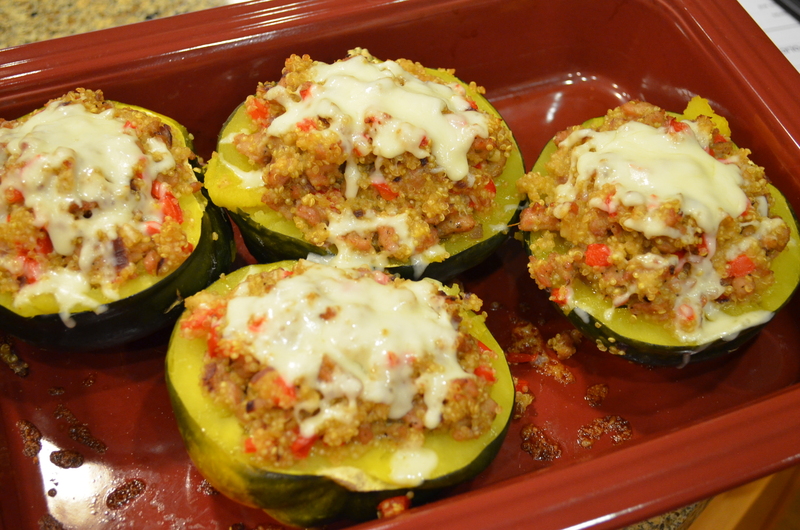 Cook 4 minutes then stir in quinoa and a tablespoon or two of the shredded mozzarella. Transfer squash halves to a dry baking dish, cut side up. Pack each with an even amount of filling and bake 20 minutes. Press shredded cheese into each half and bake 5 minutes more, or until cheese has melted. 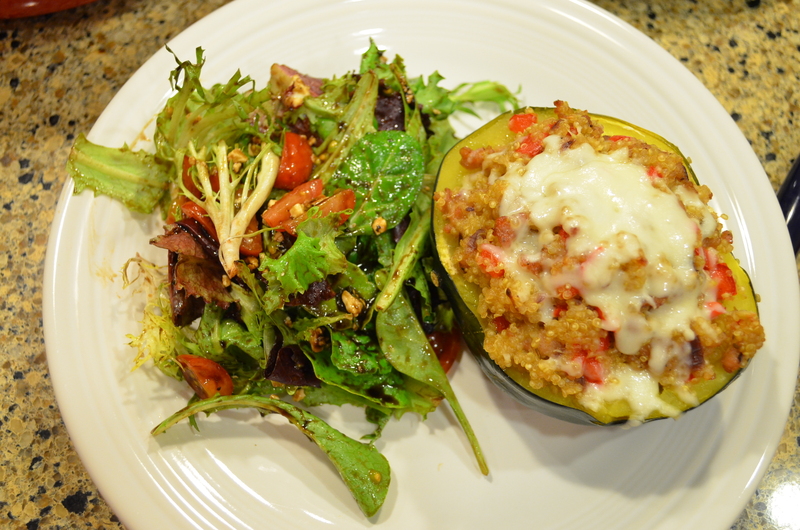 This entry was posted in Recipes and tagged Acorn Squash, chicken sausage, Delicious, dinner, Fitness Magazine, Quinoa, Red Pepper by Pieps Perfect Blend. Bookmark the permalink.